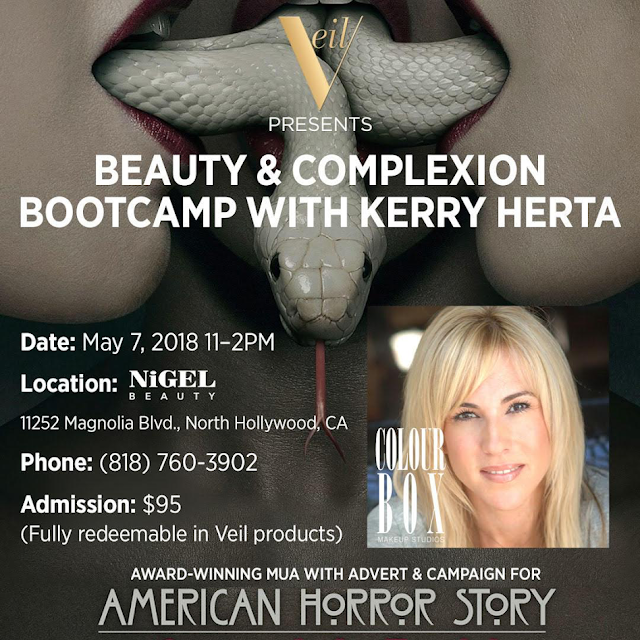 A few days ago, I had the pleasure of attending the Beauty and Complexion Bootcamp with Veil Cosmetics and Kerry Herta at Nigel Beauty Emporium. Kerry is a longtime makeup educator and founder of Colour Box Makeup Studios -- and she's also the makeup designer and department head behind the promo campaigns for all seven seasons of American Horror Story. Her master class focused on tips and tricks for a flawless complexion, creating the basic makeup look that really isn't so basic after all. I'm thrilled to bring you a behind the scenes look at what I learned from Kerry's master class! Kerry began the master class by discussing some of her favorite products from Veil Cosmetics, giving us some insider info and tips on what makes each one so great. "This line is beautiful on the skin, it’s lightweight," she said. "You know it’s not smothering somebody. When you suffocate the skin, it’s trying to break through. That could give you problems too if you’re putting that on your actor 5 days a week for 12 hours a day." Here's what she had to say about three of the products in the line. "For me, it's not a 3 in 1 -- it's an everything in 1! What you do to the skin before application is going to make or break you. It's water based and lightweight, but it can also be used as a serum. Not only is it hydrating, but it smoothes out the skin, evens out the surface and preps it. It also helps with longevity of your makeup." Kerry also referred to this product as a mixing medium and told us you can use it to sheer down creamier, heavier foundations or make cream eyeshadows! "This is one of those beautiful products with adjustable coverage. Because it’s water based, if you wait about 30 seconds in between you can add another layer. You don’t want to create a wall on your skin and a barrier that light can’t penetrate. Light is meant to penetrate, bounce off, diffuse, and products like this are really great for that." "I always like to use the same medium. The idea of putting on concealer, putting on foundation, going back with powders and creams -- there’s so much to maintain. It’s not conducive to all day long. I also want to know how a brand is naming its colors. If you’re golden neutral or rosy beige, that doesn’t make sense to me. But if you’re something like 3N Pink, that means a makeup artist was behind that line." Kerry also stressed that everyone's skin and faces are combinations these days, which means you have to identify the skin tone, the undertones and your end result. And, while we've all heard about contouring ad nauseam, Kerry prefers to refer to it as highlighting and shadowing. "Cameras and lights are looking for high points and low points. It’s our job to create dimension. Complexion fix is a great concealer, but I like to use it for highlighting and shadowing." After walking us through her favorite Veil Cosmetics products, Kerry performed a demo on what she called Money Makeup. "It’s what’s going to book you," she said. "It’s great to have a range, but it scares the bejeeburs out of clients! Especially commercially and lifestyle, this is your money makeup!" Kerry told us that she always likes to use a white palette when she works with a new client, because it helps to pick up the tones in their face and distinctly shows the different hues of products under the light. Kerry working with the Veil Cosmetics Complexion Fix. Watching Kerry work her magic was mesmerizing! I also learned a few very valuable tips and tricks during this beauty bootcamp that all makeup artists should keep in mind. 1) You don’t want to over powder. Do not powder until you have to, or only powder where you have to. Flash photography just bounces right off it. We want to get rid of the oil -- we don’t want to powder over it. It’s the same as adding water to dirt -- you’ve made mud. If you’re powdering oil, you’re just creating mud patches all over the face. 2) There’s no swooping in and swooping out with loose powder -- there’s nothing covert about that! 3) You want to understand how cameras work -- for example, HD cameras pull red tones. We’re always trying to trick the camera. Everything you do to that face before it steps out of that chair is what’s going to make or break you. 4) For camera, sometimes you want to do a shade that’s a little darker or warmer than their actual skin. If you match them totally flawlessly, they’re still a flat pancake on camera. Especially once they put all the colored gels up, you need to make sure you don’t do something where there’s not enough warmth in the skin. 5) Don’t be afraid to introduce bold colors to your clients! You can cut it or sheer it. I take a little of my mixing medium and a little cheek color -- I think it’s way easier to blend and warm up a cream color into the skin than try to do a powdered blush. A pretty rosy cheek is great to make someone look younger, and a cream is great for that. I like to layer. 6) How we train our eye is really important. I always call it mapping out a face. I start at the forehead and go down because I want to see how everything blends in. You can see one of everyone’s undertones on the cheeks. If you start going to the forehead and then the chin, it just pops. 7) The mirror in front of the client is for us. It’s not for them to track their progress and get all involved. It’s for us to look at them. So we can take our eyes off the face when we’re up close and get a better look at them. Walk away from the makeup for a second. Look at the mirror, look at how it looks as the whole picture. Sometimes you might be surprised at what jumps out at you. 8) You can’t tell until you get started. And guess what? It wipes off! You can wipe that makeup off - it can’t be the boss of you. Grab your golds, pinks and neutrals and play with all of them! "What’s really going to set you apart from thousands of others out there is knowing your products. You can be the most brilliantly talented artist on the planet, but what’s really going to set you apart is understanding these things. Knowledge is power. You never want to be in a situation where you can’t answer a question someone asks. You lose credibility. You know on the fly what you can and cannot do if you understand the physics behind it." Attending this master class was beyond interesting and informative. I loved getting the chance to hear Kerry's makeup tips and tricks! To learn more about Kerry Herta, visit kerryherta.com. Really interesting post, thanks for the tips from Kerry! I used to be able to go to master classes and I loved them. Now they just aren't around in my neck of the woods. Hearing what Kerry had to say is so interesting. Thanks for sharing. This is really cool information! I like her advice Knowledge is power. That's some really interesting tips I had never heard. Thank you for sharing those insights! I never tried starting from the forehead, I usually start with the nose and then radiate outwards. I love classes like this! So interesting. That light primer sounds like a great product that I need to try soon. It looks like you got some great tips and tricks!